In this concise and balanced survey of heresy and inquisition in the Middle Ages, Jennifer Kolpacoff Deane explores the increasingly bitter encounters between piety, reform, dissent, and the institutional Church between 1100 and 1500. Although the loaded terms of 'heresy' and 'orthodoxy' employed by ecclesiastical officials suggest a clear division between right and wrong, that division was in fact vigorously contested by medieval people at all levels of society. Deane investigates key issues that sparked confrontations between Christians, including access to scripture, apostolic models of poverty and preaching, the Eucharist and sacramental power, and clerical corruption and wealth. 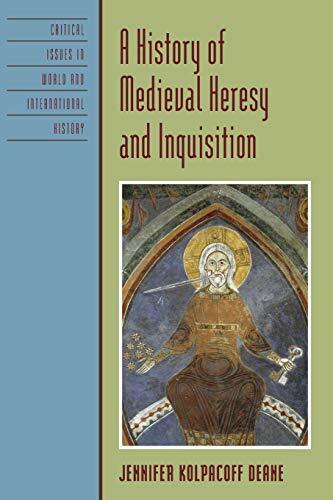 She traces the means by which Church elites developed an increasingly complex set of inquisitorial procedures and resources to identify, label, and repress 'heresy,' examines the various regional eruptions of such confrontations across medieval Europe, and considers the judicial processes that brought many to the stake. The book ranges from the 'Good Christians' of Languedoc and Lombardy and the pan-European 'Poor,' to Spiritual Franciscans, lay religious women, anticlerical and vernacular movements in England and Bohemia, mysticism, magical practices, and witchcraft. Throughout, Deane considers how the new inquisitorial bureaucracies not only fueled anxiety over heresy, but actually generated fictional 'heresies' through their own texts and techniques. Incorporating recent research and debates in the field, her analysis brings to life a compelling issue that profoundly influenced the medieval world.